Administrators with access to multiple organizations have the option to set a default organization associated with their email address. When you've set a default organization, you'll be taken directly to your default organization instead of the organization which was created first after logging in. In this article, we'll give a quick walkthrough of how to assign a default organization. First, navigate to your dashboard after logging into the website. 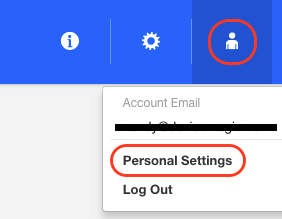 Next, click on your email address in the far right corner and then select 'Personal Settings'. You'll then be brought to your 'Edit My Account' page. From there, scroll down to the 'Default Organization' dropdown and select your new default organization. After selecting your default organization, click 'Save settings'. 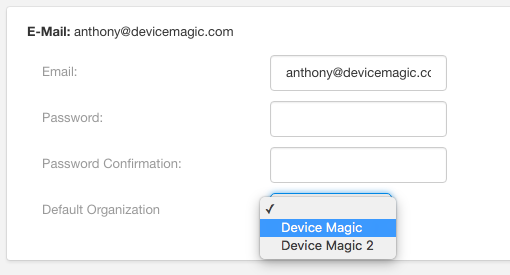 This concludes our walkthrough of setting your default organization, if you have any questions feel free to leave us a comment or send us a message at support@devicemagic.com.